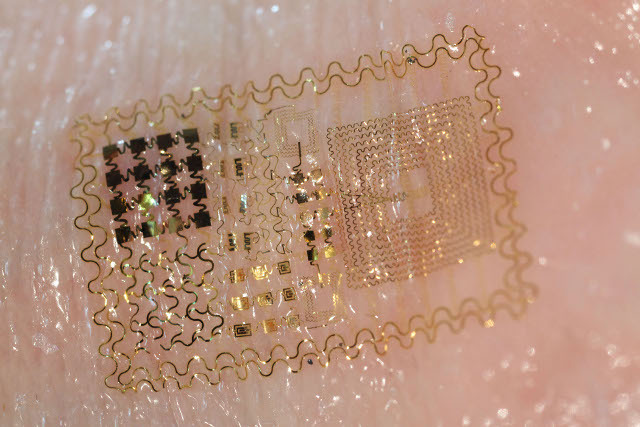 THE DEVICE: The epidermal electronic system (EES) is flexible, thinner than a human hair, and applied to the skin like a fake tattoo. Depending on the embedded circuitry, it can monitor body temperature, brain activity, or the contraction of the heart and skeletal muscles, and power tiny LEDs, transistors, or antennae for communications. It draws energy from its micro-scale solar collectors or wireless inductive coils, making it lightweight with no external power cords.